Don’t be fooled by its seemingly lo-fi tendencies or any and all belief that this is some amateurish attempt to get away with doing as little as possible, for as much as possible. 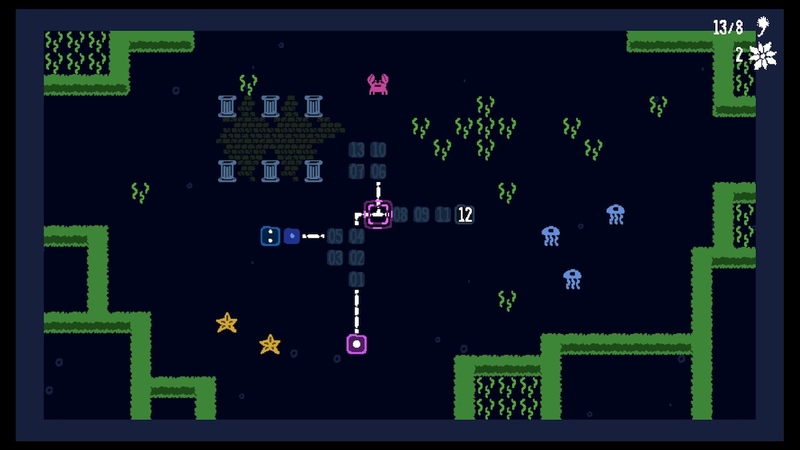 Underneath its minimal aesthetic of crudely-doodled art and stripped-back “bleep-bloop-blip” music, Baba Is You is a lot smarter and brilliantly constructed than what you may give lone Finnish developer, Arvi Teikari, credit for. 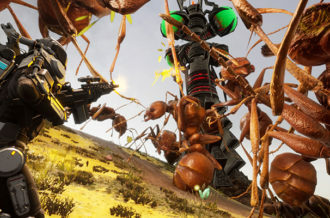 Once more, in a genre that is often befitting of the philosophy, the game so wonderfully encapsulates that majestic sensation of finally reaching that seemingly-illusive end goal. 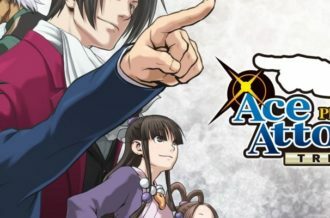 The eventual unveiling of its gameplay mechanics, and moreso, the realization of how a game not only expands on its initial premise, but seems to flip its own conventions completely on their head without warning. Think back to The Witness, Linelight, Stephen’s Sausage Roll (maybe even throw SUPERHOT in there for its [technically] puzzle-orientated problem-solving); all these games — regardless of one’s perception on their difficulty or levity for offering hints or suggestions — found a way to challenge one’s pre-conceived notion of where the boundaries lay. All of them surprising, all of them diversifying what their mechanics could generate, as such all succeeding on keeping you invested in working out the solution, one way or another. 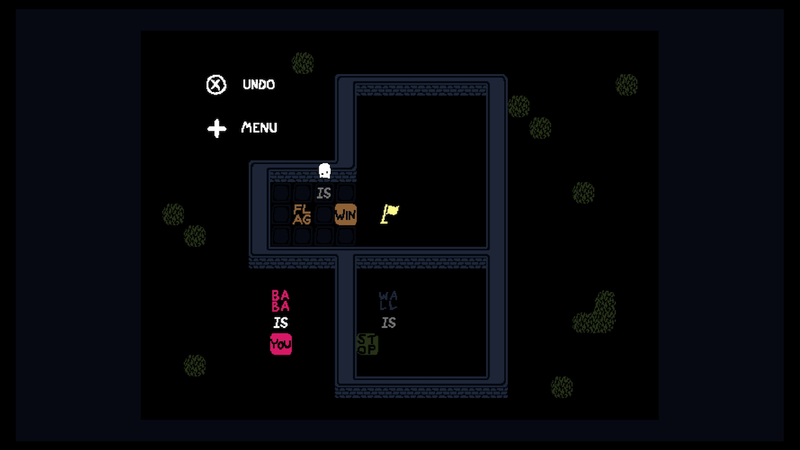 Baba Is You is no different; its Sokoban-inspired (pushing objects such as crates or boxes around a grid-based space) premise is as cunning in its appearance as it is devilishly poker-face in its refusal to offer any manner of an easy ride. Its surface-level detail may permit you to read this as merely pushing particular words/functions into place yet one of the reasons why it succeeds so quickly and easily — why Baba Is You is an entirely different beast to tame — is in that similarly-revelatory unveiling of what the game itself actually permits to be possible. 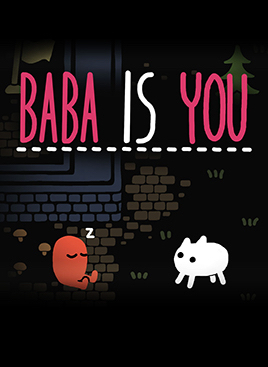 Thus unlike a lot of other puzzle games of this ilk — where the solution is predominantly singular and confined to one specific, hidden route — Baba Is You takes a different approach by allowing you to literally alter the very rules and circumstances its roughly two hundred puzzles afford. And this is not some coincidental or otherwise accidental occurrence, the game pretty much revolves around this concept and actively encourages you to explore it without concern for what may come out the other side. Those of you who have a fondness for any form of logic-based tinkering or simply the nature of rules in any subject — be it mathematics, physics, programming or whatever — Baba Is You is the kind of game that plays to that crowd. 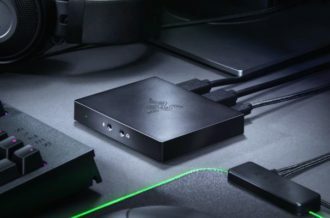 But even if you’re not, the game’s stripped-back design and easy-to-approach controls (the D-Pad doing most of the work here) make it similarly inviting for all folks who, at the very least, are willing to think outside the box and discard any previous notion that a rule is forever set in stone. 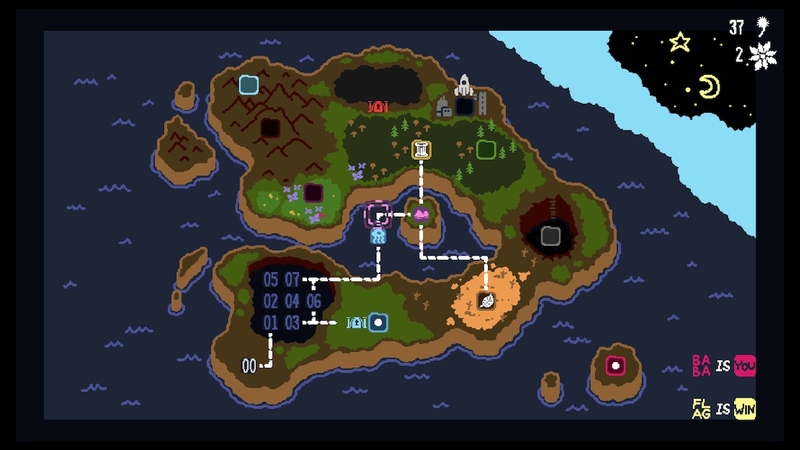 But as you gradually make your way between each of the game’s “worlds” — where around an average of ten to twelve main puzzles are based, usually requiring you to beat a minimum of eight to progress, with bonus/optional levels off the regular path — the language of Baba Is You becomes both fluent and second-nature, allowing you to ponder as to the ever-changing and flexible circumstances that are its conditions for victory. Part of the reason why the game is so inviting and thus enjoyable to work out is solely in experimenting with its declarative/conjunctive functions. Altering what constitutes as victory, what state objects are in, even what YOU are at that given time. Providing you don’t accidentally break the existential chain that generally denotes: “BABA IS YOU” — doing so, resulting in a comically-ominous low-pitch hum, your player-character/object confined to a static position, the crucial “rule” of the puzzle unwittingly broken. 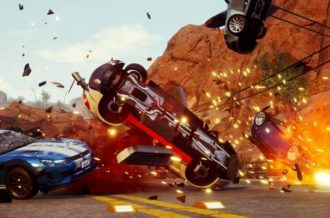 All of this only exemplifies how well the game translates its mechanics across, encouraging players to poke at the foundation, to not be afraid of trying things that may well spell disaster. To proceed through trial-and-error, in working out just where the boundaries (if such things even exist) lie. Not all object-based parameters are alterable however in a given level — some instead confined to the edges of a given level’s space, even walled off or completely inaccessible. An indication that those rules specifically are permanent. In some scenarios, this means getting to grips with and memorizing around half-a-dozen set rules, causing some to read this as overwhelming — a mental strain in having to keep tabs of and recall back to so many a rule beyond their influence. Some of course won’t find issue in this (the game lists off its permanent rules in the pause screen), instead reveling the prospect of juggling numerous possibilities and functions — even constructing branching paths like a crossword puzzle, where the conjunctive “IS” or “AND” may be used for two rules at the same time. The fun, amidst working out the solution, lies in deducing how each rule is directly or indirectly connected to another. How one function or preset may in turn affect or alter completely another one down the line. How inevitably manipulating one object or rule entirely can lead to the next rule or would-be manipulation. It demands a certain level of recollect and of keeping tabs on things admittedly, but not for a second does Baba Is You feel reliant on players working out the solution in one go. The fact you can undo any and all mistakes (to the point where you can, theoretically, revert all the way back to the very beginning…though there is an instant reset option available too) makes it clear that the solutions serve more as models one has to slowly build up a picture of rather than a daisy-chain with which all factors have to work in succession. There’ll always be that precariousness in pushing a block or word too far — one that may come in handy later on — or not accounting for an element that may inadvertently ruin a latter phase. 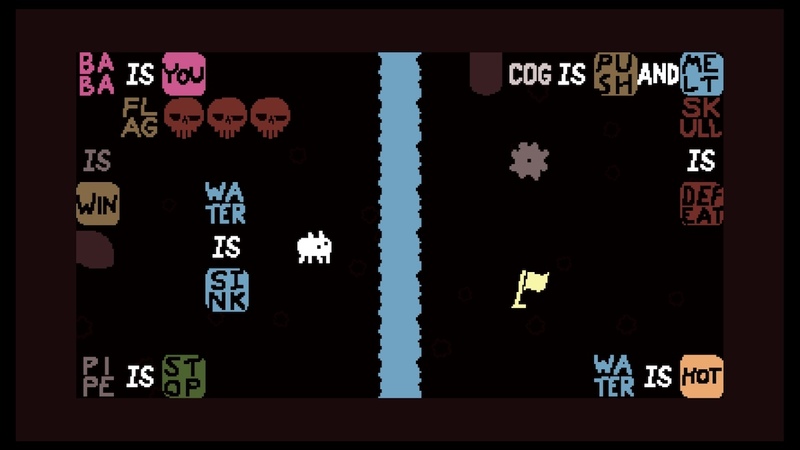 But even if that is the case, even if a misplaced word reveals itself to be the only thing preventing you from absolving of previous frustrations, there’s an undeniable charm and admirable wit as to the complexity that some of the Baba Is You‘s puzzles are orchestrated. Particularly when alteration and manipulation of one’s self come into play and the titular BABA becomes a clone, an automated drone, or both. 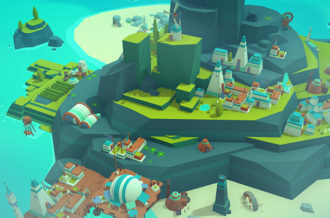 It’s these layer-atop-layer conundrums that only get increasingly added to further down the line as the game introduces entirely new functions — MOVE, TELE (short for teleport), PULL being a few — and the grid-based space provided feels a lot more specific as to where players can and can’t push the required boxes. Only here does the game’s true creativity and sheer variety of conundrums reveal themselves. Having you duplicate, even swap out what YOU even is, with present NPC models such as a crab, a robot or a similarly doodled fella referred to as KEKE. The game may reveal these bizarre requirements earlier on than anticipated, but the ways in which its later puzzles combine these with its primary rule-based mechanics almost always finds a way to baffle and surprise in its absurd outcomes. What’s even more admirable, and again rather cunning, about Baba Is You — as a result of all this — is the ways in which it jumps between requiring players to think in multiple steps and rules…and outright teasing players into assuming as much. In these cases, often housing a solution that is far simpler than its many permanent rules might imply. The biggest compliment you can give Baba Is You is its sheer effectiveness to quickly attach its players to the aesthetic of its puzzle-solving and how part of the grander revelation is in realizing that the solution might not be as convoluted as one may (understandably) suspect it to be. Baba Is You revels in its own conniving little seductions and is all the better because of it — some outcomes stress-relieving and impactful, others a lot more surprising and occasionally comical in equal parts. Even then, even if one were to discard the rightful positives that is the delightful creativity of its many puzzles, you needn’t look far to catch sight of the occasional absurdity that some of Baba Is You’s gameplay can often garner. Whether that’s pushing a specific set of blocks so that “WALL IS YOU” has you taking on the role of an entire closed-off fortification or watching as a flag — that may or may not be the WIN condition — finds itself caught between two love heart-shaped objects with the TELE function attached. Or starting a level with the intent to quickly nudge the main “BABA IS YOU” string away from an automated robot with the MOVE function attached in an attempt to stop it from breaking that critical rule. Baba Is You is full of these brief, temporary, perhaps insignificant attributes, but it’s a testament to how surreal but engaging the mechanics can get. If there are any caveats, one could address the soundtrack itself for one. A score that, in keeping to the minimalist and perhaps hurriedly-doodled aesthetic of its imagery, isn’t exactly the most diverse or elaborate of sounds, particularly during a seemingly tough-as-nails puzzle when the short loops may become a little too monotonous and potentially grating in their repetition. Another minor concern, though it should be noted this may well be a case-for-case situation, is in the game’s difficulty curve itself, with a rather surprising upturn in challenge appearing earlier on than anticipated and never really seeming to follow an identifiably straight incline as players gradually make their from one region of the game’s map to the next. 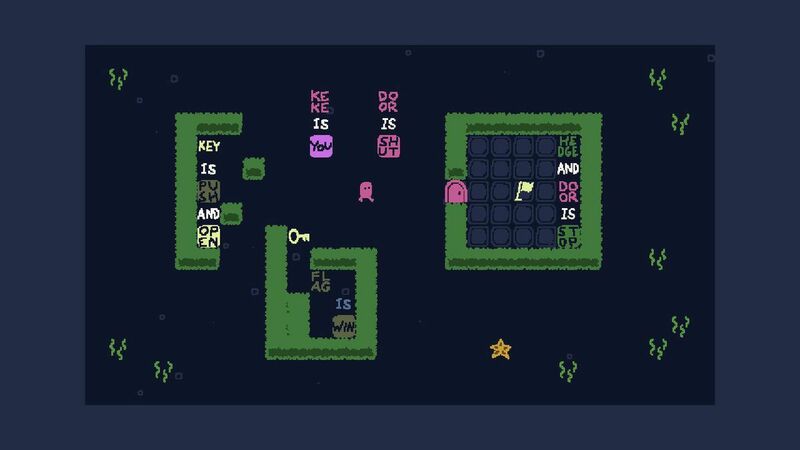 Even so, as uneventful its music may seem, it does little to sway the view that Baba Is You is an outstandingly inventive and delightful puzzle game to crack. A game that is as anarchic as it is orderly in its logic-based intentions, seldom do the easy-to-grasp mechanics and calculating demeanour of its appearance, run tired or stale despite its simple concept of mere block pushing. Resulting in one surprising or unexpected turn of events after another. But what’s more deserving of its praise, beyond the chemical-like concocting of altered elements and functions, is the game’s continued unpredictability and the sheer breadth at which it reacts to these many rule sets. Going from frustrating, to enlightening, to comical and back again to frustrating, all in such a short span of time. To incur — revel in even — all these emotions, yet still be so consistently intriguing and engaging an affair marks Baba Is You down as one of the year’s most thoughtful and entertaining releases thus far.